Tally Solutions regularly releases updates for Tally and keeps the software updated to the latest amendments in the GST, Income Tax and so on – as well as introducing new features in Tally ERP 9. In the same way, the past 2 releases by Tally Solutions were a big ones because both of them included some major changes in GST in Tally. Let’s have a look at the important and major updates in Tally. GSTR-4 is the GST Return which is filed by the Composition Dealers who sell taxable goods and services as well as who purchase taxable goods and services under reverse charge. GSTR-4 is single return that needs to by filed by the persons who have opted for Composition Scheme under the GST law. Currently, the threshold limit for mandatory e-Way Bill in case of interstate sales is ₹50,000 per invoice. But, inside some states i.e. intrastate transactions, it can be different from state to state and till now, Tally had only one option for the threshold limit of e-Way Bills. Now, with this latest Tally Update – Release 6.4.6, you can now enter and manage separate threshold limits for intrastate as well as interstate transactions. From now on, it will be more easy for you to create and manage e-Way bills in Tally. 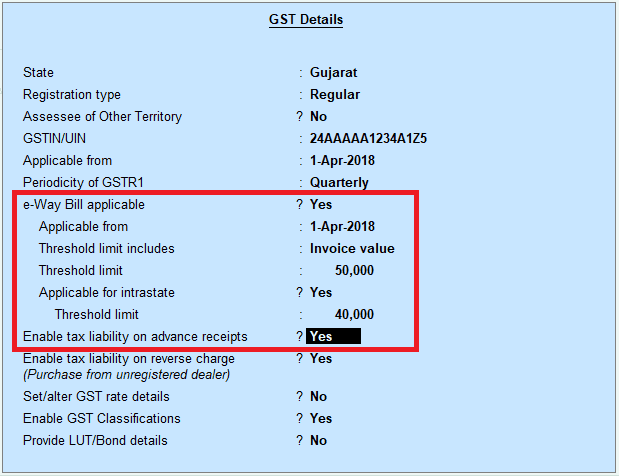 Till now, when you were recording transactions in Tally with GST, if there was an error, you would have only got the warning or error message. But, after this release 6.4.6, you can identify the error in detail as to what is the error because Tally will specifically display that error. If you have entered the GST Transaction in Tally in an incorrect way, Tally will display the following errors. Selection of interstate and intrastate natures of transactions in the same voucher. Interstate purchases from composition dealers. Interstate sales to composition dealers. Same GSTIN/UIN entered for company and party ledger. Mismatch in party’s country and nature of transaction. Mismatch in place of supply and nature of transaction. These were the major and important updates of Tally.ERP 9 – Release 6.4.6 and now we will look at the major and important updates of Tally.ERP 9 Release 6.4.7. GSTIN Validation is a simple error that appears if you enter invalid GSTIN while creating party ledgers or while entering GSTIN anywhere in Tally. Till now, only for a few types of taxpayers, GSTIN would get validated. 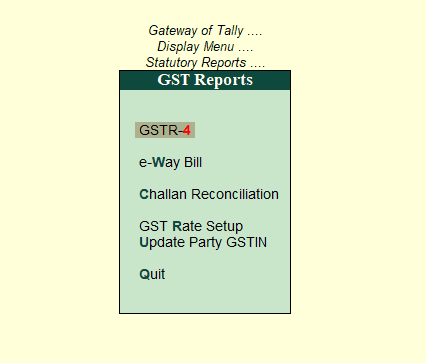 Now, after the new update in Tally.ERP 9 – Release 6.4.7, GSTIN will get validated for all the taxpayers in Tally. If you are in fabrics manufacturing business, previously, you were not be able to take the input credit of the GST paid in reverse charge. But from now on, as per the latest notification in the 28th meeting of GST Council, you can take the credit of the GST that you paid in reverse charge mechanism if you are in the fabrics business. This whole functionality has been introduced in Tally.ERP 9 – Release 6.4.7 for the first time so you can easily file the returns. You can also take credit of reverse charges in the current as well future periods as per your own wish. Another important point to note here is that you can now also keep track of total liability towards reverse charge and the total input credit availed or to be availed in Tally with one simple report named – Input Credit to be Booked. While recording the voucher in Tally, if the voucher date was changed, then the narration went away. That problem has been resolved with this update. .Also, if the date was changed, the cursor or the selection moved directly to the first field of the voucher which has been rectified in this Tally update. When you upload the JSON file of Consolidated e-Way Bill generated from Tally.ERP 9, an error occurred which said, “The filename is invalid”. This problem has been solved and now, the error will no longer occur. Certain special characters are allowed by NIC for e-Way Bill. Previously, you were unable to export them in JSON and Excel file formats. Well, now you can export the special characters for e-Way Bill in JSON and MS Excel file formats in Tally. Now, you can create Journal Vouchers in Tally to claim input tax credit on Reverse Charge Transactions in current on subsequent taxation periods. These journal entries will appear in the Input Credit to be Booked Report in GSTR-3B in Tally. You can now also print GSTIN or UIN of the party in Confirmation of Accounts Report. 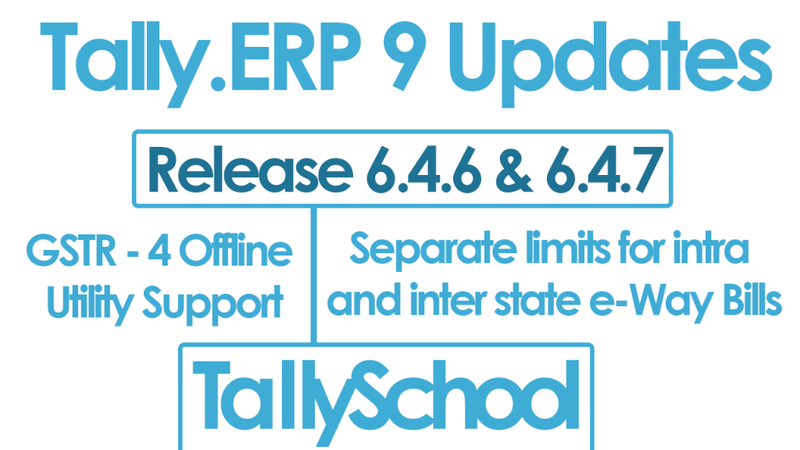 These were some of the big changes or updates in the latest 2 releases 6.4.6 and 6.4.7 of Tally.ERP 9. In these two latest releases, Tally has solved many issues and problems but these were the most important and noticeable ones. Especially, the GST updates are required because of frequent changes in law and new introductions in the GST law. If you have any questions or suggestions, please comment below and I will be happy to help you out. Also, if you liked the post, please share it with your friends who are using Tally. I am using Tally ERP 9 release 6.4.7, I unable to export the data into excel it show error “UNABLE TO INTIALIZE EXCEL APPLICATION” please help how to fix this error. Please check your computer has Excel installed. Also, try to reinstall Tally one more time with latest version available. If the problem still remains, please email me the screen shot. Is there any book to learn tally erp 9 from basic upto update. I am interested in learning it. There are books and I have listed them down on this page.